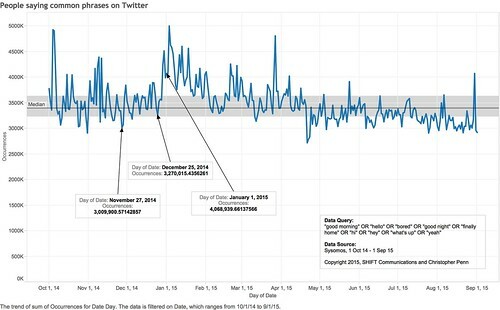 Do People Use Social Media During the Holidays? @cspenn what seems to be the consensus about social media posting on public holidays? People are home but are they on their devices? Instinct says yes, of course, but instinct isn’t data. So what might we look at? 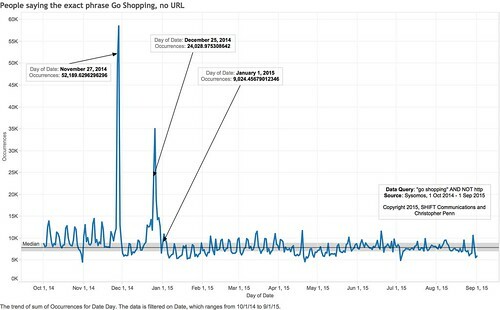 As highlighted above with the arrows, usage on Thanksgiving is in the lowest quartile, while Christmas Day is in the third quartile. New Year’s Day is in the first quartile, indicating high usage. So, the basic answer to Emilio’s question is yes, people are around and using their devices. 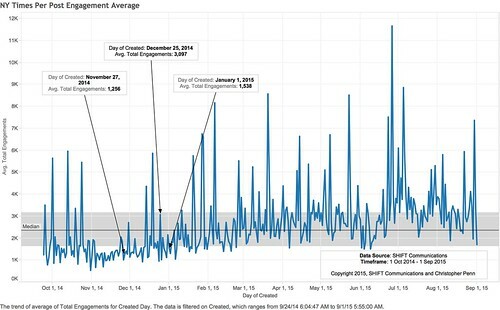 Above, we see that Thanksgiving Day and New Year’s Day are in the lowest quartile for people engaging with their posts (favorites, retweets), while Christmas Day is in the second quartile, near the very top. Note also that while Thanksgiving is low in engagement, most of the fourth quarter of the year is in the lowest quartile. Engagement overall is a problem during this period, not just on specific days. Above, while volume is lower, in the thousands rather than the millions, people expressing their shopping activities appears to be quite high. Should you post on social media during the holidays? As long as you have something relevant and interesting to post, the answer appears to be yes. People are around, using their devices. The greater challenge you’ll face is posting something worth reading and discussing amidst all the noise.